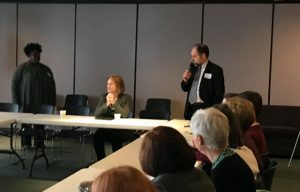 On April 3, Melanie Neufeld, representing Seattle Mennonite Church in Lake City and Pastor Julie Blum of Maple Leaf Lutheran Church in Meadowbrook attended a Church Council of Greater Seattle gathering to vision and engage on the issues of homelessness, policing and the Youth County Jail. At this gathering, Mayor Jenny Durkan met with a large (30 approximately) Faith contingent from throughout the City of Seattle. Ms. Neufeld also is a representative of the Lake City Homelessness Task Force. Pastor Julie represents the Meadowbrook church, which has hosted a nightly coed shelter since 1996. Speaking to the group, the Mayor spoke of ‘reform’ as an ongoing experience based on listening and not as a ‘destination’. She also mentioned the need to address the middle class in the challenge of homelessness. Also, she acknowledged how rates of violence are disproportionate to the south end of the city. Mayor Durkan also stressed the need for the City of Seattle to create a culture of ‘sustained courage’ in addressing the challenges of hyper-change and rapid growth to all its citizenry. As the many issues around homelessness, policing and youth crime continue to dominate the governing of Seattle, she encouraged everyone in the room to ‘stay at the table’ and committed to building relationships that supported human dignity at every level of city services, planning and implementation. Examples of early learning and preschool support were also raised as an important tool in addressing inequities in the city, specifically, in communities such as Rainier Valley and South Park, where disparity is very apparent and demanding recourse.